Happy Anniversary! The spousal unit and I were married 36 years ago today, and we spent our honeymoon in Mexico. How appropriate that here we are again! Instead of going out for a romantic candlelit dinner, we went to a cooking class. 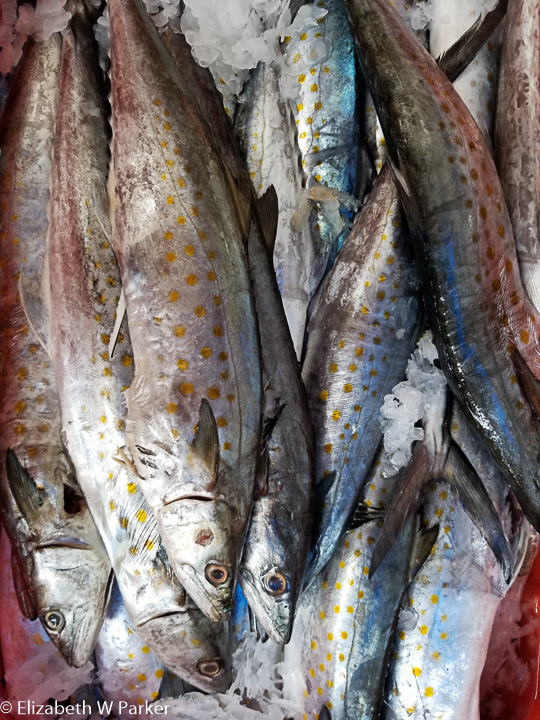 Our hotel is right near the Marina of Puerto Vallarta (that is also the name of our neighborhood) and our cooking class was just a few short blocks away. We met our chef, Chef Mavi Graf, at 10 am and headed directly off to do the marketing. She was also buying for a tasting dinner she would host in the same evening, so we got to tag a long as she made many stops for meat, fish, vegetables, cheese and spices. 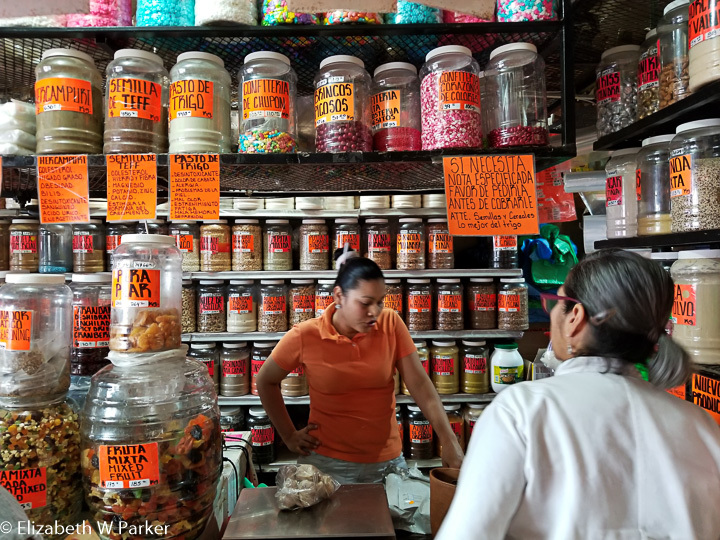 The route took us from the 5th of December barrio of Puerto Vallarta, to Pitillal (where we also stopped to see a small church with a magnificent red oak sculpture of Christ ascending), to the Mercado just 2 km from here, called Aramara. 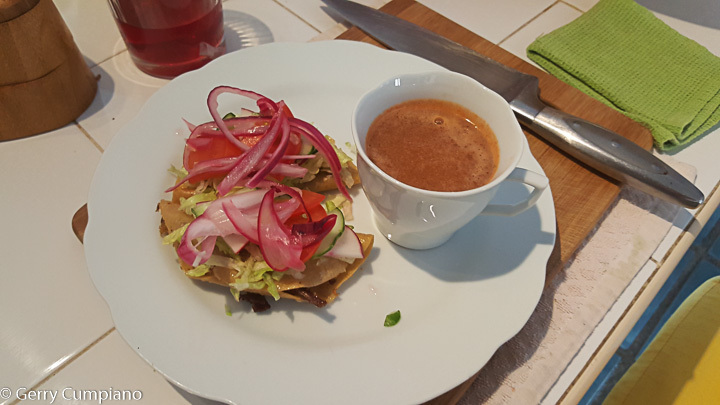 After two hours of shopping, laden with packages, we returned to Chef Mavi’s house where we commenced to prepare our luncheon menu – mini-sopes with smoked marlin, tacos dorados, and chiles en nogado. Our prep time was filled with wonderful conversation, comparing our lives and experiences, talking about food and cooking. We didn’t skimp on the beverages – we sipped cold te de Jamaica during the prep; after our first appetizer (the tacos) we moved on to tamarind margaritas; and we ate our lunch with cold cava – to toast to our anniversary and new friends! Our cooking class was a private one. Chef Mavi (pronounced like Mari, but with a “v”) only does private classes – there might be more people, but it would be a single group of friends. She is knowledgeable and gregarious, so there are no uncomfortable silences. We felt genuinely welcome in her home and treated like friends, not clients. 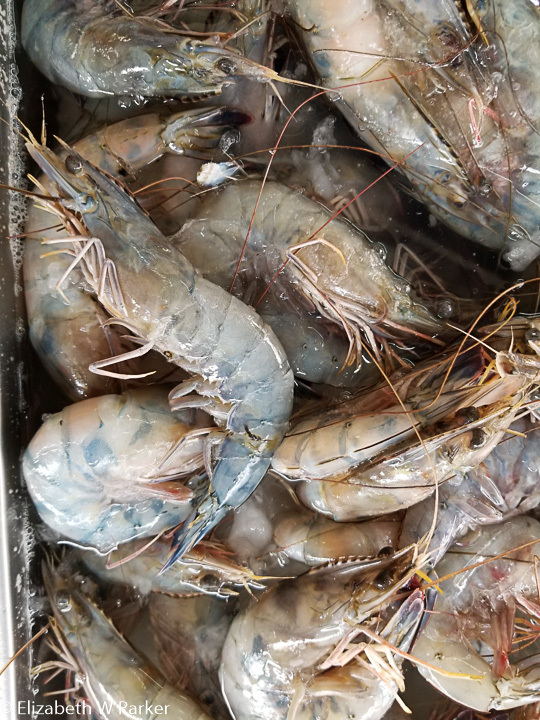 Since Puerto Vallarta is a foodie haven and food is always a part of the travel we do, I will go into some details about the dishes we made. Those of you who know me will be surprised that I chose the dishes and that none of them are vegan. Yes, my veganism is relative: When I travel I like to eat the local fare and when those dishes involve eating meat and fish and dairy, so be it. I love all those foods – I just don’t choose to eat them on a daily basis…ok? So, starting with the tacos. The meat, beef, was cooked in broth for two hours and then left to sit overnight. We shredded it and combined it with just one potato that had cooked in the same broth. The tortillas (that was a fun stop at the market!) had been purchased the previous day, and while still fresh from the market, the extra “skin” was removed. Then the tortillas sat overnight to allow them to dry out a bit. Still flexible, they would now hold together. We filled half of them with the meat mixture, folded them over and deep fried them! (You already know this is going to be good, right?) Meanwhile with the broth from the meat we made a “caldo” that would accompany the tacos: We blended fresh tomatoes with garlic and milk in a blender, added that to an equal amount of the broth and simmered it while we fried the tacos and prepared lettuce, tomatoes, radishes and red onions to put on top. This traditional way of serving tacos produces a complete meal: The tacos have the main protein (meat), the raw veggies on top are the salad and the broth is sipped on the side. I thought it the perfect lunch…Definitely could be vegan – Mavi and I discussed replacing the meat with patties of sweet potatoes or squash with beans. I am thinking tofu could find its way into a taco easily enough too! I almost forgot to relate that Gerry had prepared what we gringos call “salsa” and we had this with our tacos, too. Our second appetizer was the mini- sopes. Now, I have not had a sope to explain how the mini ones compare, but I can describe them to you and you can make your personal comparison if you have had them before. The base was plantain. We peeled a black-skinned plantain and sliced the fruit. That was boiled until soft and then mashed. To it we added a product called Maseca, which is maiz (corn) milled for tortillas (with water) then dried. It was a powder – finer than cornmeal, but not as fine as cornstarch or flour. When added to the mashed plantain we kneaded the resulting masa to the consistency of Play-Doh. With golf-ball sized balls flattened into discs, the little sopes were put onto the comal and toasted on both sides. Once cool enough to handle, we shaped them into little bowls, flattening the centers and pulling up on the edges. If you are familiar with Puerto Rican food think of a toston relleno. Into this little bowl went a mixture of fresh vegetables (diced very small) cooked with the smoked marlin, which when pulled apart by hand had the texture of canned tuna. Spiced with lots of oregano (surprised me that it was not cumin) this was a delicious appetizer, topped decoratively with a sliver of jalapeno. Our main course was the most delicious and gorgeous surprise of the meal. We used chiles poblanos, large, pointy green peppers, blackened over the gas stove flame and skinned. A slit in the side (not the top!) made filling the pepper easy and with the cut side facing down on the plate, a very elegant presentation. Inside, we put a mixture of finely chopped fresh and dried fruits, vegetables and ground beef and pork, cooked in a deep pot and seasoned with cloves and cinnamon, as well as oregano. Once the flavors were blended, the meat cooked, and everything nice and hot, this went into that side slit in the chiles. The sauce was based on walnuts (nogado). It was creamy and thick but pourable. Topping it off – fresh pomegranate seeds. Chef Mavi explained that this is a tradition Christmas dish for her family – red, white and green. 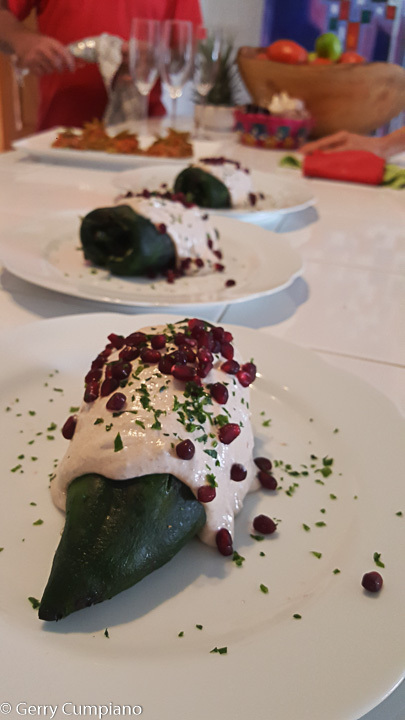 It is also a dish to serve at a wedding – the colors are those of the Mexican flag and the ingredients represent both the mixing of families and cultures. Once upon a time this dish was made with whatever the diners could communally come up with. When food was scarce, maybe one family had an apple, another a guava and so one. The filling thus became a symbol of cooperation and community, another important factor in Mexican culture. 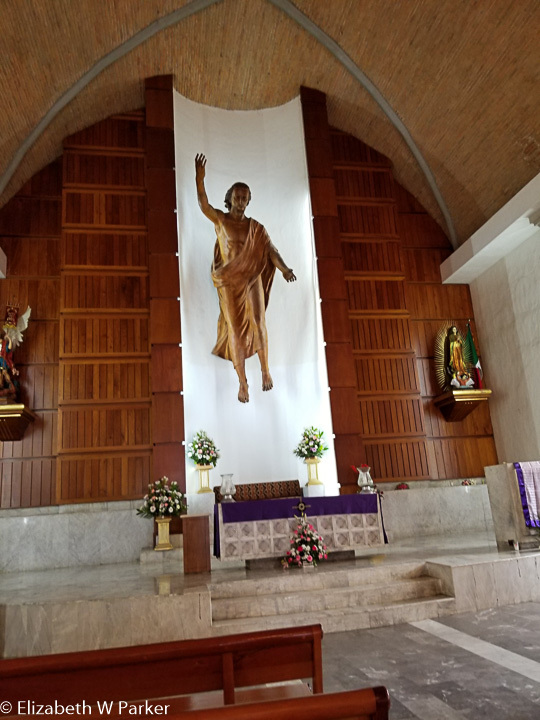 Christ Ascending in the Church in Pitillal. Chef Mavi took us here because she heard that I like to visit churches when I travel. 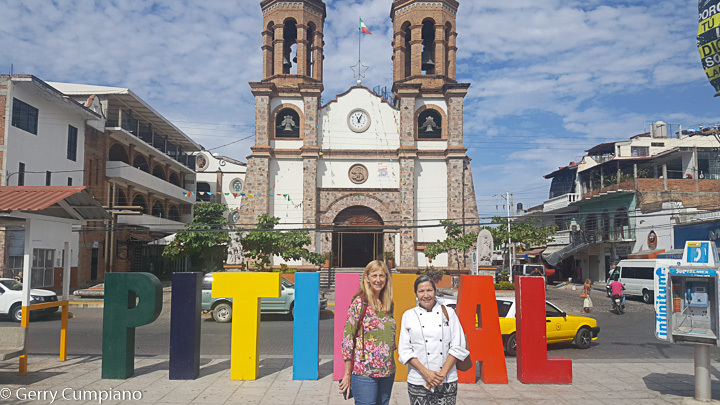 I sincerely hope that when you plan a trip to Puerto Vallarta you will book a cooking class with Chef Mavi, and experience Mexican hospitality and food as we did, in this very personal way. Don’t worry about language, she speaks perfect English! This memory of this experience will last a lifetime. Between the margaritas and the champagne, we were pretty much done (in) for the day! We returned to our hotel about 4 to nap until evening. There’s still more. Keep reading!